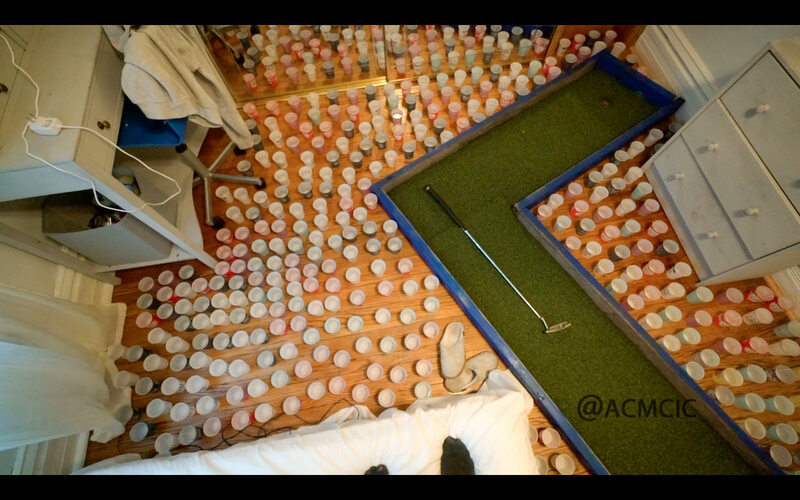 This is a prank of epic greatness. There are Rube Goldberg machines and then there's Sprice Machines' Lemonade Machine, an elaborate, nine-minute-long exercise in dispensing cold lemonade. It impressively winds through an entire house (even the toilet has a role) and out through the backyard before reaching its refreshing conclusion. Our first ever house wide machine project - The Lemonade Machine. 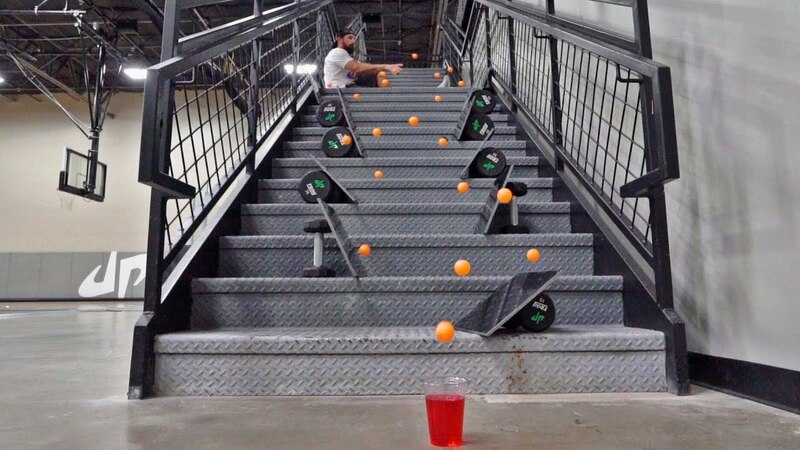 This complex chain reaction travels through the kitchen, kid's room, bathroom, office, parent's room, living room, patio & backyard using everyday objects to automatically pour lemonade for the entire team of builders. In the first part of this video, the guys at the sports/comedy YouTube Channel Dude Perfect launch a ping pong ball through a Rube Goldberg-like contraption that fills a room. Once it's made its way through, then they show off their mad trick shots using ping pong balls. The video's vibe is bro-ish but the tricks are impressive! 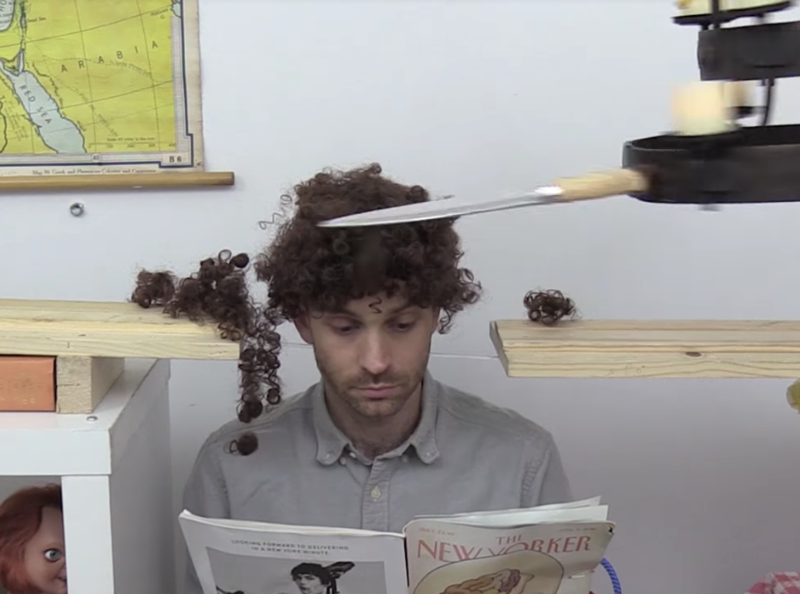 Move over Flowbee, inventor Joseph Herscher of Joseph's Machines has figured out a fresh new way to cut one's hair at home using a swinging chandelier and a large kitchen knife. He calls it the "Terrifying Automatic Hair Cutter." Wouldn't it be nice to get a haircut in the comfort of your own home, for free? I've made a machine for that. Don’t try this at home folks, it may not look like it but I am a professional! Joseph Herscher of Joseph's Machines has outdone himself with his latest machine. 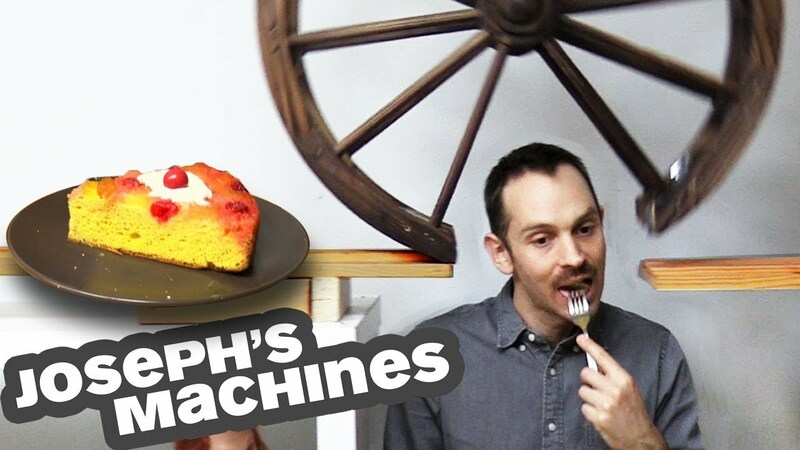 It's an incredibly complex Rube Goldberg machine that took him three months to make called "The Cake Server" and it does just that... serve cake. The "cherry on top" is literally a cherry on top. Watch! Yep, the Harlem Globetrotters are still doing their thing and as evidenced by their YouTube channel (don't miss their "one take" video from last year), these basketball-spinning darlings are doing it better than ever. These courtside jesters recently teamed up students from Georgia Tech's colleges of Industrial Design and Music to make this Rube Goldberg 'trick shot' machine. Watch as their starred, red, white, and blue basketball makes its way through a complicated path from a Globetrotter to an impressive hole-in-one. It's a fun watch (despite all those editing cuts). It's not a good machine or a precise machine, but it is still a machine that will wrap gifts (and sandwiches and ankles) in 10 seconds. 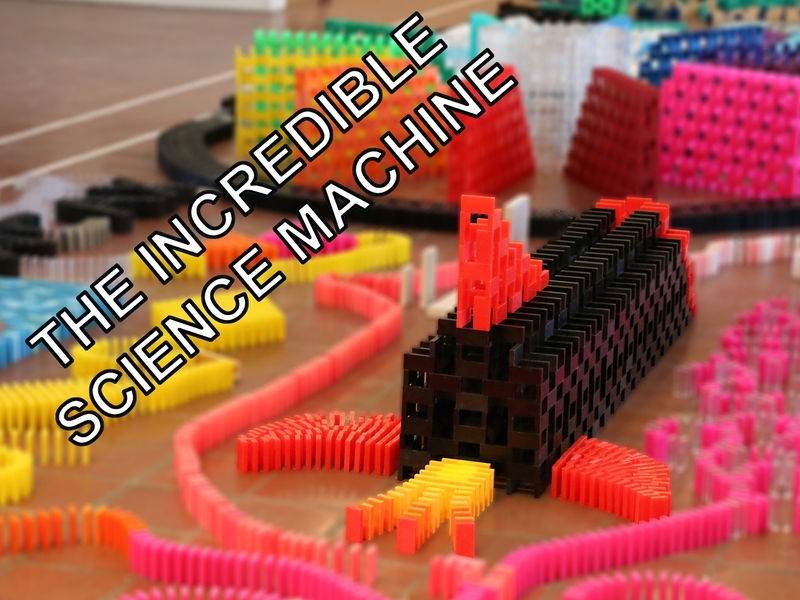 3M showcased its products in a clever way by creating a chain reaction machine. The Post-It Note cascade at the end is wonderful. Seven-year-old Audri designed this astounding Rube Goldberg machine, and then systematically studied its failure modes and improved it, producing a fine video account of his work. He is made of pure distillate of awesomesauce.